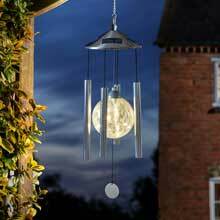 Solar lights are the ideal statement garden lighting piece for any home. 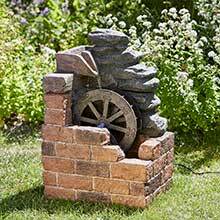 Their self-sustaining power allows these wonderful lights to shine bright all year round without the worry of new batteries or a mains power supply. 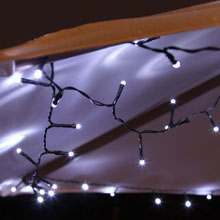 Our ranges include solar fairy lights, decking lights and much more, all without the constraints of wiring or the worry of a cloud inducing electricity bill. 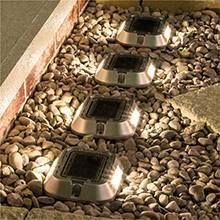 Make your garden shine bright and peruse our LED solar lights range below! Solar LED lights are now arguably more common than their electric or battery powered counterparts. 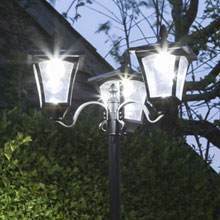 The technology behind solar outdoor lighting is no longer considered revolutionary, and in fact has seen continuous advancements since the early days of solar power. Of course we'd be lying if we said that performance of solar lights is unaffected during winter months - though there are garden solar lights designed specifically to support winter use. 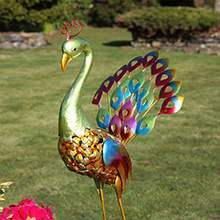 Generally speaking, things like solar fairy lights, path lights, solar wall lights and novelty items like solar animal ornaments and the like are most often seen during spring and summer. 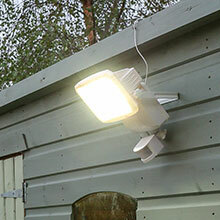 More practical items like security lights and shed lights are used throughout the year. We'd highly recommend visiting our blog for much more information and advice with regards to maximising the performance of solar powered lighting. 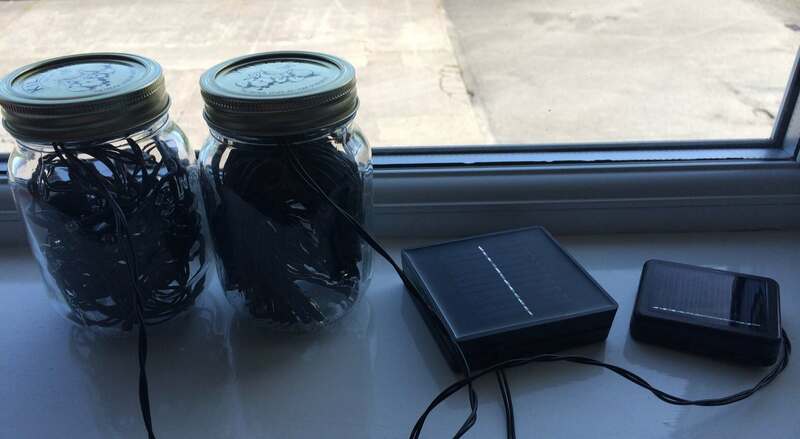 The general premise though is that solar lights work by using a solar panel containing a photovoltaic cell that collects energy from the sun during the day, and stores it within a battery. A light sensor called a photoresistor then detects when there is no longer any daylight or energy from the sun and turns the LED on. At dawn when the light sensor detects the suns energy once again, the LED will switch off and begin to store energy for the following evening. It’s all very clever, but all you need to do it switch them on, put them outside and let them do all the hard work for you. Something that seems to cause confusion among a number of people is whether or not solar lights can receive charge through glass window panes. Often people want to leave solar lights on a window ledge, perhaps in a porch or conservatory. Does this work though? Let's take a look. 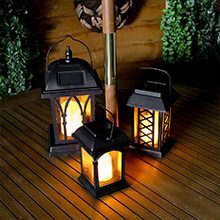 As we know, solar lights work by absorbing the sun's rays through a solar panel - which contains a photovoltaic cell - and using this power to generate an electrical current. Glass as used in windows and conservatory panels creates a barrier between the sun and the panel, which inhibits the amount of sunlight received by the panel and therefore the output of the light. But light travels through the glass? Yes, whilst light does obviously travel through the glass, some of this is blocked by the iron content in glass. In addition to this some of the light is reflected, meaning that a significant amount of power will be lost. This will vary depending on the specific glass used as well as other factors, but the power loss could be in excess of 50%. Don't solar panels actually contain glass though? Again the answer is yes! Solar panels often have a glass covering, but this is typically a special type of low-iron glass that is also extremely thin and so does not block light in the same way as regular glass. If you want optimal performance from your solar lights, it is best to leave them outside in a position whereby they can receive as much direct sunlight as possible. However, if you do want lights in your conservatory or porch, they should still work but will not do so for as long and will not shine quite so brightly. To answer this we first need to understand how solar lights work. The article linked has a much more in depth description of this, but essentially the solar panel contains a photovoltaic cell, which converts sunlight into an electrical current. This is then stored by a re-chargeable battery and used to power the LED lights. The size and quality of the solar cell will influence how effective the solar panel and therefore light actually is, but the biggest influence on the performance of solar lights is still the amount of sunlight received. Does the panel only work if direct sunlight is received then? Actually, any amount of light can be absorbed by the solar cell (it doesn't even need to come from the sun), but the amount of power it is able to output increases dramatically with direct sunlight. The sun is our most powerful and abundant light source so the more exposure to it that your solar panel has, the more charge the battery on your solar lights will receive. So sunlight > bedroom light? Yes! Whilst your bedroom light might provide a very, very small amount of charge for your solar light's battery, we really would recommend placing it somewhere that it can receive direct sunlight during the peak hours of sunshine where you live. Will solar lights work in the daytime? As a general rule, no. 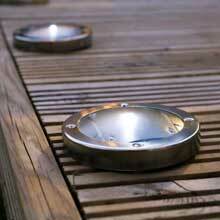 Solar lights will charge during the day and activate automatically at dusk. Some solar lights do have a permanent on/off setting though, meaning you can switch them on during the day if you really want to. Why you would want to is a question only you can answer!